Enjoy some swanky hotel vibes without checking in. Enjoy some swanky hotel vibes without checking in. The next Rendition, The W's monthly music series, sets up the sounds on Wednesday, June 24. HOTEL TIME (NO KEY REQUIRED): There was a time, not so long ago, where if you were inside a hotel you were A) staying at the hotel or B) working at the hotel. True, once every so often a big holiday meal, say an Easter brunch, would attract locals, but generally the business of the property stayed to those who were staying there. That's changed, in a big way, as hotels connect with area residents on a number of fronts, some to do with dining or refreshments, some to do with entertainment, some to do with both. Look to The W Los Angeles -- West Beverly Hills, which recently introduced a summertime, once-a-month music series that's open to guests as well as neighbors alike. Called Rendition, the live music series is all about featuring a great act over a two-hour set that starts at the oh-so-continental hour of 8 o'clock (an intriguing change-of-pace from the happy hour happenings at many bars and restaurants, those that rev up around 5 p.m.). It kind of makes you want to put on a tie, or at least change out of your workaday tie into something a little more elegant, and find that dressier late-night vibe, one that LA isn't always known for but our big-city cousin the Big Apple is (a city that loves to get its scene going at 8 o'clock or later). WEDNESDAY, JUNE 24... is the next Rendition, and smoky-chanteuse-y pop doyens David & Devine will be at the mics. On the tables? The Living Room Bar will offer a host of specialty cocktails in honor of the special series. It's true that other cities have gained a rep for the after-happy-hour, supper-club vibe, over our own, which isn't quite fair: We do the 8 o'clock, smooth-tune scene well, too. The fact that this is all happening in a hotel only ups its old-school, glittering-metropolis cred. Adding to the glitter? The W just completed a $25-million renovation. 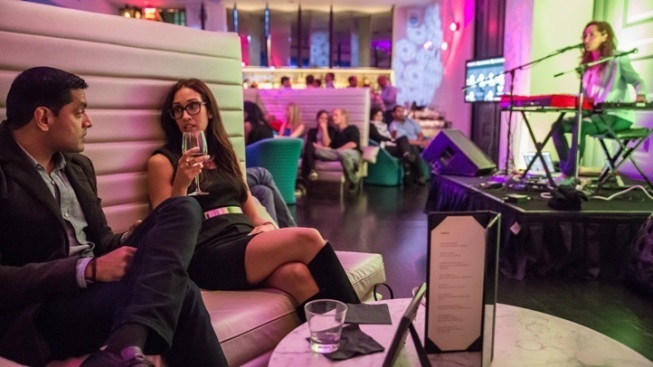 That you don't have to be a guest to enjoy some of the swank is a trend worth applauding (but save some applause for the live musical acts, too).